My initial interest in diving stemmed from a common ground; that of the electronic babysitter, the TV. Having been born in 1959, I was fortunate enough to grow up with the syndicated reruns of Sea Hunt, along with all the first run episodes of Voyage to the Bottom of the Sea. Of course, Captain Cousteau, and the crew of the Calypso, had a huge influence on me as well. The local library had a few books devoted to scuba diving, and I must have been responsible for 50% of the wear to their bindings. My guess is that George Fee was the culprit for the remaining, as we grew up in the same small city. Anyway, around 1969 or so, I begged (actually mercilessly irritated) my parents for a set of snorkeling gear. My pleadings were rewarded with a set of Voit Skin Diver fins, a Voit 3M29 Custom mask, and a Voit F5B snorkel. All of which were purchased at a sporting goods store in the Dayton, Ohio area. Like so many of us, I honed my snorkeling skills during the summer months in local pools. After a couple of years, I then began pestering my folks to allow me to take scuba diving lessons. When they inquired as to where to find such training in land locked Ohio, I already had the name of Mr. John O'Rourke. John was the owner of a local photography shop, and taught diving classes through, and in conjunction with, Wilmington College. Following their initial contact with Mr. O'Rourke, I was told that I was "too young", but to come back in a few years. Those "couple years" dragged on until 1974 arrived. I won't elaborate on how much more difficult the training was "back in the day", but suffice it to say that a significant number of divers getting certified today would have been told not to come back after the first night in the pool. Nuff' said! One positive note, though, was that the students were also given the opportunity to try out Mr. O'Rourke's DA Aquamaster in the pool during one of the last pool sessions. After the much anticipated pool and classroom training, I anxiously waited for the open water check out dives that were scheduled at Sportsman's Lake in Cedarville, Ohio. Despite the bone chilling thermoclines, and a rather loose fitting wet suit, I was enthralled with the weekend of diving. I had located my utopia, and was not about to ever look back. I yearned to have a new Swimaster MR12 regulator, and headed to a favorite dive shop with my older brother, who was more than happy to drive as long as I paid for food and gas. Upon walking in the store, I was dismayed to discover that they did not have the MR12 in stock. I ended up purchasing a new USD Calypso VI with a balanced piston first stage. I still have that original reg, but haven't used it for years, as I now have my treasured MR12 models! My collection of gear slowly materialized, with the majority of the labels bearing the Voit/Swimaster name. Hence, my long lasting interest in the brand. My high school years and early college years diving adventures were limited to Sportsman's Lake, along with an occasional trip to Lake Erie with my family. My dad would let me solo dive in shallow water around our family's speed boat as long as I stayed in close proximity to the boat. Back in those days, you were lucky to have 5-7' of visibility, as the Zebra Mussels had yet to invade the Great Lakes. I did manage to take two trips to Long Island in the Bahamas prior to hitting age 20. George Fee went on that second trip as well, but was a young, newly certified diver. Like many of us, I didn't dive much in my early days into adulthood. Motorcycles, firearms, women, and work took up much of my "idle" time. I would dive on several weekends each summer, but wasn't able to get serious about it until I met a young RN who had a keen interest in learning to dive. That young nurse, Sheila, was soon enrolled in an open water class at Wright State University. She completed her open water dives at Portage Quarry later that summer, while I tagged along with the group. The next summer, we were married, and spent our honeymoon diving in the Florida Keys. 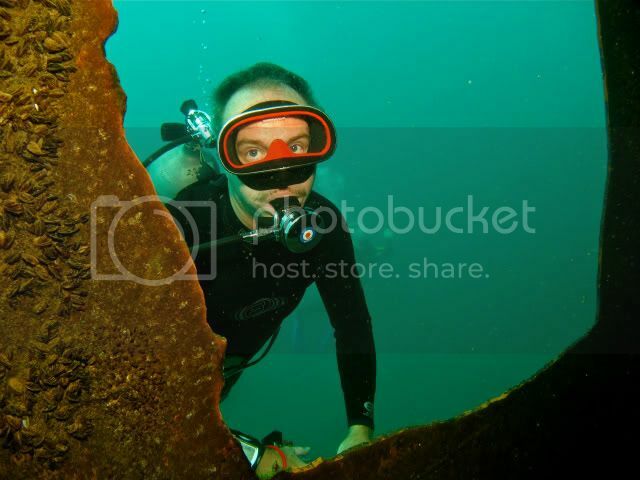 I began taking a keen interest in vintage diving gear during the mid 90s. At first, my focus was on the single hose regulators of the late 1960s. I was particularly enamored of the MR12 and the Scubapro Mark V/109 models. By the end of the 1998, I had already rebuilt a growing number of vintage single hose models. I was still lacking a coveted double hose model. Most of the local dive shops told me that parts for the double hose models simply weren't available anymore. About that same time, I contacted the Editor of Rodale's Scuba Diving Magazine, Mr. David Taylor, with an article idea that I wanted to propose. ScubaLab, headed by the now deceased, Mr. Jon Hardy, regularly tested scuba regulators on a ANSTI Breathing Simulator. At that time, the magazine rented time on Scubapro's ANSTI machine, as the cost of purchasing their own machine was too prohibitive. My idea was to test vintage single hose regs of various configurations, and to compare their performance and features to those of modern designs. David Taylor really liked the proposal, and he had Jon Hardy make contact with me to discuss how we wanted to proceed. Jon and I decided to use a wide variety of designs to determine what impact various engineering features played on the evolution of the regulator. We chose the following models: Voit Little Gem (unbalanced piston 1st stage, with a tilt-valve 2nd), Voit MR12, Swimaster MR12 II, Scubapro Mark VII, and my original reg, the USD Calypso VI (balanced piston 1st stage). I carefully rebuilt each reg to the best of my ability, and shipped them off to California. Jon send me scanned results of each reg's ANSTI runs. We were both impressed to find that all the balanced 1st stage models did very well on the simulator all the way up to the USN Class A standards in some instances. The Calypso VI did exceptionally well, and scored a remarkable Work-of-Breathing score of 1.56 j/l at 198'. Some modern regs touted as "high performance" would be hard pressed to match that score. Following that article, I asked David Taylor if he had ever considered publishing articles in which diving science topics were explained in "layman's terms". One such idea was that of explaining how a nitrox computer created its calculations by converting information into an equivalent air depth. David asked me to submit a few articles for his review, and to provide a list of possible topics. He, and the other editors, really liked my submitted articles. They also proved popular with the readers, and the idea soon blossomed into a monthly column entitled, "Scuba Science". The column ran for the next two years or so, and then the magazine was sold to another publisher. Sadly, David Taylor moved on to working as a full time journalism professor. While I thoroughly enjoyed my tenure with the magazine, I was saddened to see the new editors make significant changes to the content. While David was at the helm, the magazine was sort of a "Consumer's Report" when it came to gear testing. In fact, a number of manufacturers pulled advertising from its pages because they weren't happy with the results of how their gear did in ScubaLab testing. There were even lawsuits threatened claiming that their company's reputation had been damaged by the lackluster reports. Interestingly enough, those suits were dropped when they realized that Jon Hardy and David Taylor were not to be swayed by groundless threats. About this same time, I began diving with a young man who also had a strong interest in vintage regs. That diver happened to be our own Rob Studnicka. Rob and I both owned a growing number of double hose regs that we had managed to get working with cobbled together parts. Rob's "specialty" was that of creating mouthpiece one-way valves by using the seals from the top of 2 liter pop bottles, and stainless steel machine bolts. My, what did we all do before the advent of Vintage Double Hose's reproduction parts? It was a wonder that the two of us didn't give up the cause. 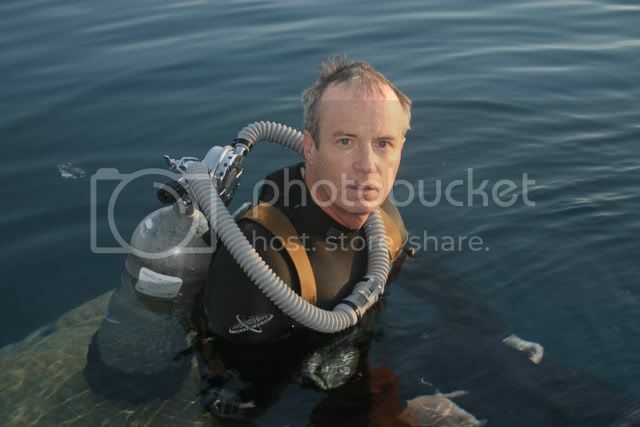 One particularly interesting dive was when I was using a USD Mistral that had an original diaphragm. The diaphragm had a slightly misshapen edge, but I was convinced it would work just fine. About half way into the dive, I began coughing rather strongly. Apparently, my lungs took offense to the fine spray of water that I was getting on each deep inhalation. When I exited the water, I was a bit concerned to see that my coughed up mucus was blood tinged. I decided to make the next dive on one of my Voit MR12 regs. Had common sense prevailed, I would have packed up the gear and headed home. As my friendship with Rob grew, we began taking diving trips together. Our use of double hose regs would always draw a crowd of divers. My guess is that most of them expected us not to return from the dive! We eventually began making contacts with other vintage gear collectors, and much to our delight, found that we were not lone rebels amongst the diving world. Now the "fraternity" of vintage gear enthusiasts has grown to include members from throughout the world. Vintage Double Hose and NAVED has served to provide the knowledge and parts necessary for us to enjoy our hobby in a way that no one ever thought possible years ago. This summer I will celebrate my 38th year of diving. I plan on diving with as many of my vintage diving buddies as possible. Rob, Barb, Allan, and I will be diving the awesome wrecks of the St. Lawrence in early July. Later that month, Sheila and I will be in Bonaire, with Herman serving as our guide to the wonderful reefs. Summer will come to an end with many of us spending the weekend together at Portage Quarry for the Legends of Diving event. Until then, happy diving! Thank you Greg for a great read and allowing us to learn a little more about you. I remember and was a fan of your science articles. 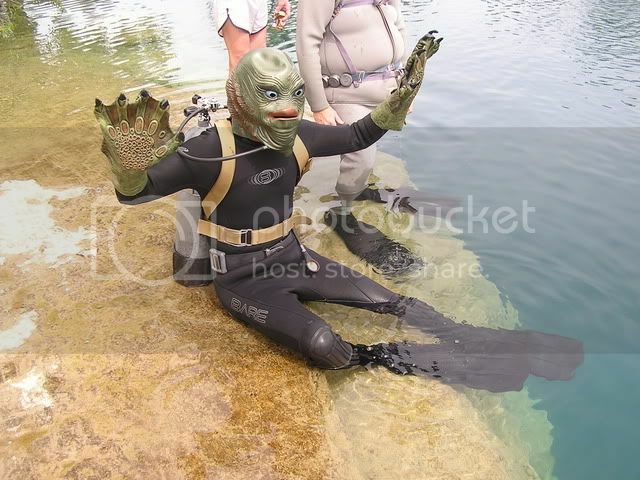 Greg Barlow at Portage Quarry 2009.....Some of these divers should take up golf. Thank you for sharing your background in diving with us. Again you as others have before you, have given me a glimpse into the diver behind all of the post on VDH. Ocean Trekker, Dangerous When Wet. "Rules are for the obedience of fools and the guidance of wise men" Douglas Barder. Greg, very much enjoyed the read and also enjoyed meeting you at Portage this past summer. You need to hich a ride on Rob & Barbs next drip down to dive Marthas. It's another big cold hole in the ground, but we do try pretty hard to be good hosts down here! Enjoyed reading your profile Greg..now if we can just get the months to Boniare over with we will be set. I too enjoyed the write up. The photo's too. Thanks for putting that together! What a great write up. Thanks for sharing all that information about ScubaLab testing, I stopped reading the magazine about 6 years ago when it all seemed so watered down. I had a recollection of them testing things to more strigent levels in the past and your write-up proves I wasn't imagining things. And thanks again for all your great MR 12 advice. You are truely an asset to us new 'vintage' guys. It's becuase of you that I now have an MR12 and an MR12 II. 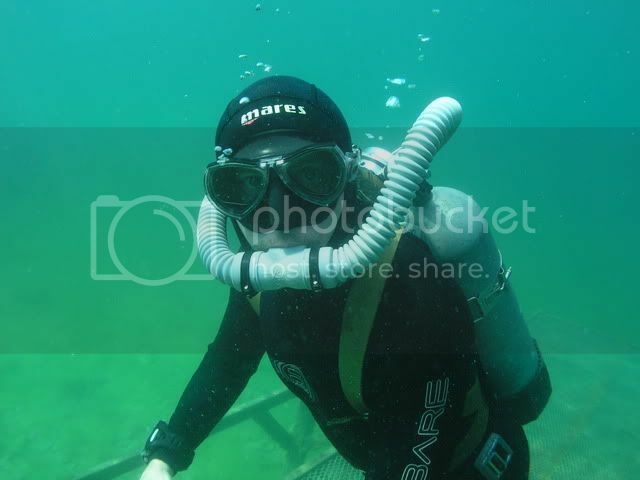 Wow, now I want to call in sick at work to go dive one of the local mudholes with you again! The friendship of many has been inspired and created while together we've explored beneath the waves the wonders of God's creation. Cool writeup Greg! Thanks for the single-hose rebuilds and the (multitude of) questions you answered.